Three NES games are coming to the Nintendo Switch Online service this month, including a star of the Mushroom Kingdom, a star of the boxing ring and a star of, well, the stars themselves! Super Mario Bros.: The Lost Levels, Punch-Out!! Featuring Mr. Dream and Star Solider will all be available to play on the Nintendo Switch system starting on April 10. 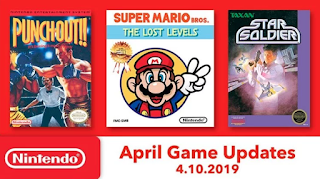 These three games join the growing library of classic NES games in the Nintendo Entertainment System – Nintendo Switch Online collection. The varied collection currently consists of dozens of games, including Super Mario Bros. 3, Donkey Kong and The Legend of Zelda, among many others. All of these NES games have been enhanced with online features and, using the power of Nintendo Switch, can be played at home on the TV or on the go. Nintendo Switch Online members also gain access to the free-to-download software Tetris 99 as a special offer. The game includes online events like last month’s Tetris 99 MAXIMUS CUP.